Just in case you were wondering what the price of coffee is in Beijing, China. Here you go! Prices are in Chinese Yuan (RMB). For conversion into US Dollars, divide the amount by 6.1. 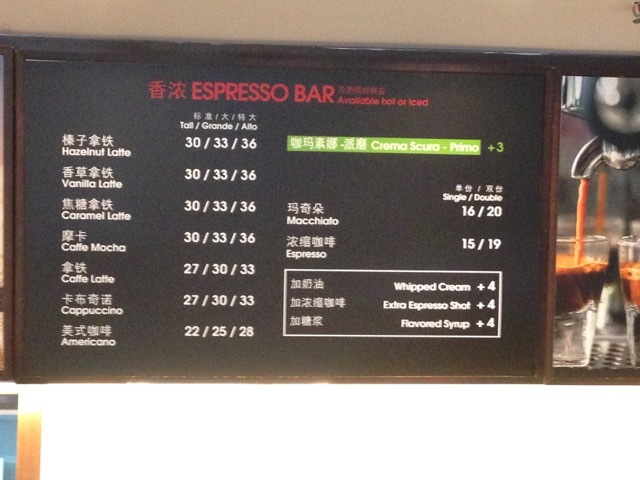 For example a small vanilla latte is 30 RMB / 6.1 = 4.92 USD. It’s not cheap. We usually reserve one day a week for personal indulgence while surfing the internet and catching up on emails. A month ago, I would have said that the Chinese language sounds harsh and choppy. Today, however, as a beginner, I am beginning to appreciate the beauty of the language, both in its written forms and spoken sounds. Chinese is an elegant language rich with history and meaning. The five tones of the language (there is a neutral tone with no tonal markings) create a type of melody in the sentence structure. The longer the phrasing, the longer the melody. When the phrasing is short (five or less words), then the sentence can sound choppy. A grammatical rules dictates that the first word of two words using the third tone change to second tone when sequential. This means the first word is spoken using second tone, then the second word is spoken using the third tone. In effect, the melody is always changing. It does not remain stagnate. Each Chinese written character has a rich history of development, both in the writing of the character (e.g., simplified Chinese) and its formation. Many words are based upon compound characters, some of which no longer exist as single words in the language. A good example of this is mou (please forgive the lack of PinYin), which meant eye, and is part of several existing words, but now the word for eye is something else. Most characters were based on ancient pictographs that tell a story. Once you know the ancient pictographs and can see how they evolved to present form, they make sense. For example, the ancient pictograph for the word “I/me” depicts a person holding a sword in his hand. The ancient pictograph for the word “you” depicts a person hiding in the house. The storyline is something like: “I have a sword. I am powerful. You should be afraid of me. You should hide in your home.” Present form, simplified Chinese, vaguely depicts the characters for hand and sword (I/me) and roof/small (you). When I was growing up, China was essentially closed to Americans. There was little or no reason to study Chinese. This changed with President Nixon visited China and the two countries opened trade relations with each other. Suddenly, there was an opportunity motivated by commerce (not military intelligence) to learn Chinese. There were few Chinese instructors in America and the perception was that Chinese was very difficult to learn. 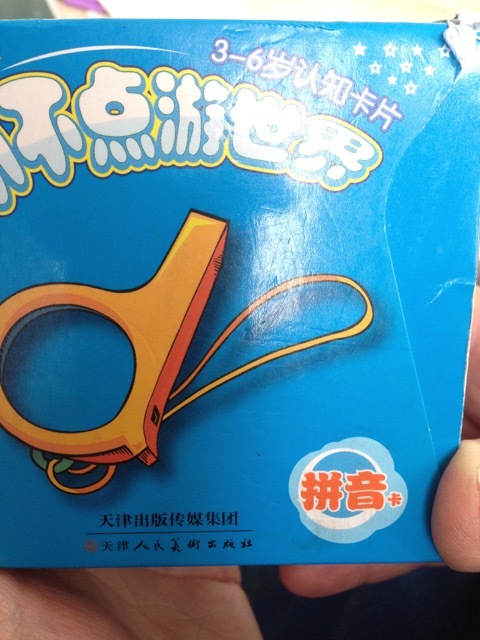 The Chinese language is challenging, but not overwhelming difficult that learning it is impossible. We just lacked both opportunity and motivation. I have always appreciated Chinese culture, but now with opportunity thanks to the new VISA law revisions in both American and China, we can now appreciate each other’s cultures in new ways — like learning to speak each other’s languages. The weekend brought an opportunity to explore Beijing, so we found a bicycle rental place online (www.bikebeijing.com). 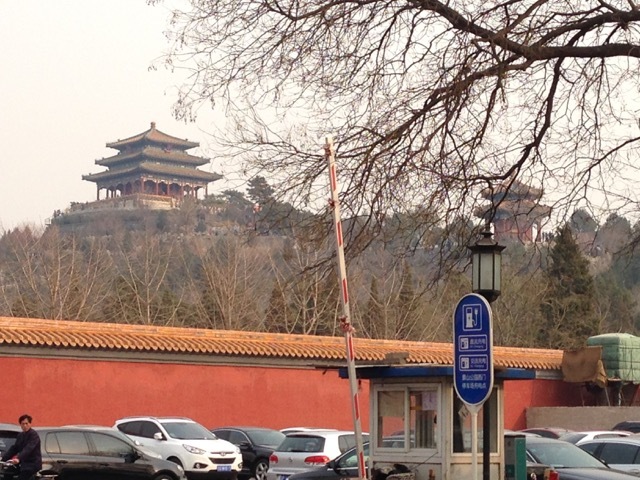 They offer guided tours in English of the Forbidden City and ancient alleyways (Hutongs), and nighttime tours. We arrived at the shop (No. 81 – 3 Beiheyan Street, Beijing) too late for a tour, so we rented two bikes for 100 RMB each and took off on our own. We biked a hutong (ancient alleyway). It was very cool and crowded. We would love to go back there again. 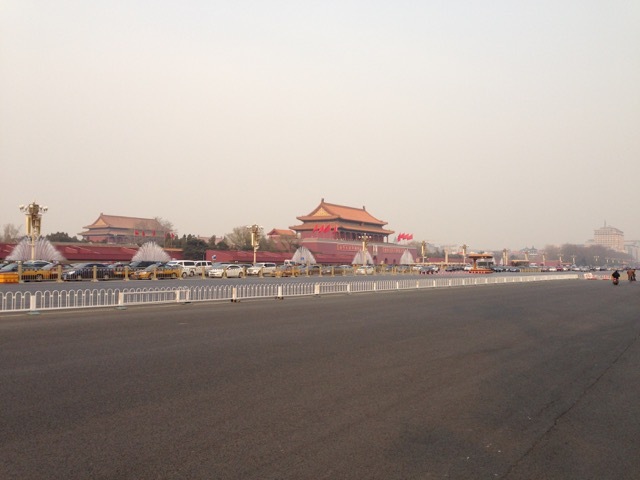 We biked around the Forbidden City and in front of Tian’anmen Square. There legislature/congress must be in session, because there were a lot of policeman and soldiers everywhere. The bikes were GIANT brand city bikes, i.e., one-speed with a basket on the front handle bars. We biked a couple of ancient alleys, went around a series of lakes, then biked around the Forbidden City. It was a leisurely pace. We stopped often and took pictures. It took us about 2 hours. We witnessed an altercation between a street vendor and policeman. We were on a bike path on the main street in front of Tian’anmen Square, which the police had barricaded at checkpoints. The street vendor was on his 3-wheel mini truck and gave the police offer a piece of his mind and tried to push his way through. I was waiting for a taser gun to come out, but the policeman held his cool. The vendor dislodged the movable, accordian-style, extending barricade enough to open a space on the other end, which another vendor promptly took advantage of and snuck through. Then as the policeman turned, the vendor also pushed his way through. Nothing happened. I don’t think the police officer was wearing a weapon. Once we stopped to take a couple of pictures of Tian’amen Square but a police officer quickly came over and told us not to take pictures. But, these are the few I was able to take before I knew better. 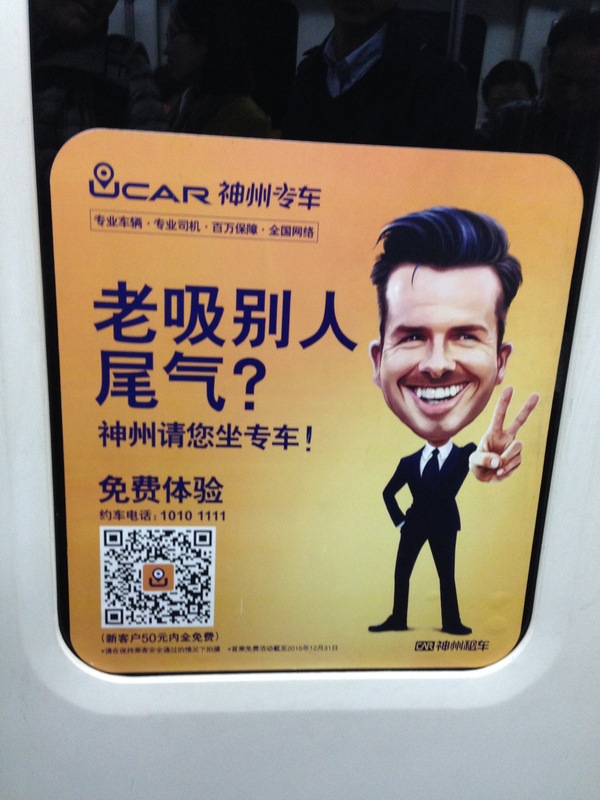 Beckham flashes “victory” sign to Beijing Commuters every day. Every time I take the No. 10 Subway, I see David Beckham’s face flashing me the victory sign. I guess he signed with Jaguar Landrover in China as a brand ambassador in March 2014. A student seating next to me explained (in English) that the characters to the left of Beckham’s image are his name, spelled phonetically, in Chinese characters. My name is Ryan. And you? My name is Sun Wen. Just a sample of how we spend our weeknight evenings. Our teacher, Li Hong, is using flash cards appropriate for ages 3-6 to drill us in correct pronunciation for vowels and consonants. After three days, we still have some trouble with a couple of sounds, but we are getting better. We still struggle with “e”. Pictured below is our teacher Yang Yu, she is teaching us how to read and write Chinese characters. We are focusing on the learning 50 common radicals used in 80 percent of most Chinese characters, which either help in pronunciation or in determining the meaning. She uses pictograms to describe the evolution of the character to present form and stories to describe its meaning. Today we read our first simple dialogue all in Chinese character. The last picture below are my scribblings in our notebooks. My favorite story is the one depicting the characters for “I” and “you.” The character for “I” has two parts: hand + weapon. The character for “You” has three parts: people + roof (home) + small. The story goes like this: “I have a weapon in my hand, so you should be afraid and hide in your house.” It sure helps us remember how to write the characters. 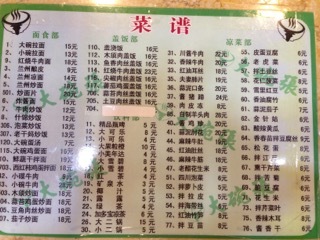 Reading a Menu — It’s Chinese to Me! We are just recently enrolled in language school in Beijing, but we have been living in China for over 30 days. We thought we could negotiate restaurants by pointing at pictures in menus or prepared items on display. Those places, however, are expensive, and, we are on a budget. This means we need to search out those local culinary treasures in neighborhood “hole-in-the-wall” places. The overhead is low and they focus on the food. Can you read and understand this menu? (See above photo.) No? Neither can I. I thought I could get by with a phrase book, or Chinese dictionary app on my iPhone, but it is hit and miss, especially when you enter a restaurant that specializes in noodles and serves them 50 different ways. My pronunciation needs to improve. My tones are off, which changes the meaning of the word. Numerous times the person behind the counter has looked at me with blank incomprehension and I was sure I got the words right, but I must have mispronounced either the tone or the vowel. Rather than hold up the line at lunch time, I finally resort to pointing at a number, just to order something. So, until I can pronounce my vowels and tones, I had better get started on learning how to read Chinese so that I can order. We have never missed a meal, but every eating out is an adventure as we order a “mystery” dish. Today, we had number #4. It turned out to be cooked and drained thin noodles in peanut sauce. My goal is to learn this menu within 2 weeks or less. Our language school is in the middle of a business complex of modern high-rise buildings. The ground-level floors are mostly devoted to retail and food, with the upper stores reserved for business. You can imagine hundreds of workers pouring out of their buildings for lunch at nearly the same time. There are lots of Chinese noodle shops and these little snack shops (far left). My wife noticed this sign “Flash Burritos” (middle photo) so we went inside to a mini-version of Chipotle’s (far right photo). They even had guacamole. I ordered the mutton burrito. You don’t get that every day in the USA. It was good. 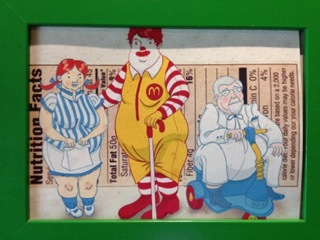 At the counter, near the cash register, they had this photo caricaturing Wendy’s, McDonald’s, and Kentucky Fried Chicken fast-food restaurants. I have seen several McD’s and KFC in China, and, were they are, I have also discovered fatter Chinese people. It truly is in the diet and lifestyle. Being Westernized through fast-food is not good. We were so excited to report the progress we are making after only two days of language school to our young Chinese colleagues in Henan by phone. One of them remarked affirmingly, “Oh, good! You are learning Chinese the traditional way at the pre-primary level.” We had a good laugh, but she was right. We are beginners. This is just fine with us. We are learning quickly and having fun. 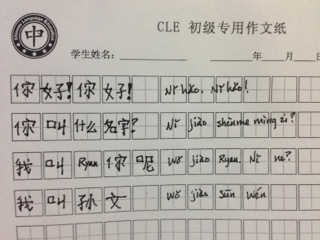 The traditional way is to learn the 6 basic strokes and 22 compound strokes in forming a Chinese character. We are learning their names and how to make them. Today we learned 15 characters, which are commonly recurrent in speech and writing, 11 of which also form radicals. We we learned their meaning and pronunciation, how to write them in both character form and in Pinyin, and determined which ones serve also as radicals and how to write them. Today we learned the characters for: middle, door, person, female, mountain, sun/day, mouth, moon/month, small, big, king, tree, water, fire, and earth. Our teacher showed us how these basic characters are used in compounds to form other common words. Chinese characters have undergone four evolutions. Originally pictographs, the early characters actually make a lot of sense. For example, imagine an eye. Look at the photo below. The first two pictographs are obvious but the last two are not. In the 1950’s Chairman Mao launched a simplified Chinese character reform to help the average peasant/famer to read. Literacy, up to that point was the privilege of the elite classes, who had time and money to spend on education. This literacy program simplified the characters. The more complicated, traditional characters are still used to day in Japan, Taiwan, and even Hong Kong. In addition to the characters, we reviewed the Pinyin system’s 21 initials (consonants) and 36 finals (vowels) and 4 tones (plus a neutral tone). Our teacher informed us that native English speakers actually have an easier time learning Chinese pronunciation, since all the sounds within the Chinese language are contained within the English language. Japanese and Korean native speakers have to learn new sounds for which they are unaccustomed. It is a matter, however, of training our ears. Each person has their own way of speaking with a slight accent. We learned grammar points involving tone placement when it involves the finals: “a,” combinations of “e/i/u” (always goes on the “e”), and combinations of “o/u/i” (goes on the “o” or most open vowel, and combinations of “u/i” (goes on the last vowel). Another grammar point involves how to write vowels starting uen (un), uei (ui), iou (iu), uo (wo), ia (ya), and u-umlaut + e (yue). We practiced pronunciation using phonetics and places of articulation. I have never watched a person’s mouth so intently as I am now trying to pick up how our teacher makes certain sounds with her the tongue, vocal chords, and glottal express of air. Lot’s of fun! Lot’s of work.